← Oia, Santorini, Kyklades, Greece: A Fine Place to Read a Book. It took me a full day of experiencing Naxos to find the word that best describes my hosts at the Margo Studios and the village of Naxos on the port. There is a feeling here that is unlike that of any high-tourist island, seaside town, or major city I have ever visited, barring none. Beauty is one facet of the experience. The Aegean Sea and the Kyklades island group – the scene of Homeric tales and the Greek myths I learned as a child – is beautiful, no doubt. The waters are idyllic aquamarine, the sunsets – and they compare fine to Gulf Coast sunsets, which are also lovely – are breathtaking, and I have not seen a single cloud – believe me when I say that I’ve been looking – in four full days. 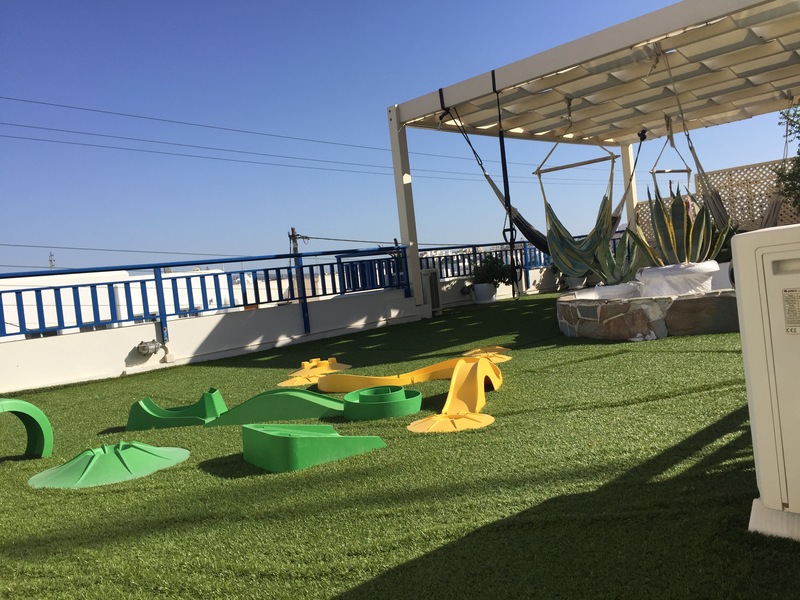 Service, particularly at Margo Studios (or Naxos Margo, per the website), is another element of the experience here in Naxos. But it absolutely does not do justice to the facts. Upon my arrival, my hosts – and I am thinking of them first as hosts and second as proprietors or managers – welcomed me with a free drink and a twenty-minute introduction to the island and its beaches, restaurants and café, culture, and physical geography. They insisted on picking me up in their van from my arrival point at the port – admittedly, only a 10 minute drive or twenty minute walk away from the property, but still a touch that no hostel and few hotels offer. There was a four-person room that had gone without reservation, and they let me know that they were putting me there so I’d have space to stretch out until such time as someone booked the room last minute – and at that time, they’d collect my baggage and move it to the single room for which I paid. When I awoke this morning at the tender hour of 10am, I came to the patio to read and come fully to my senses. The morning crew inquired as to whether I’d like something to drink and then brought me coffee and a sweet cake as well as cold water. I didn’t fully realize that it’s standard here not to pay for any of this – it took me until this evening to arrive at full recognition of this fact. My expectation is derived from my experiences, having visited so many other places. Precisely speaking, for everywhere else I have visited it to be expected that every convenience comes with an associated cost for services rendered. Not here. I sat in the courtyard for perhaps 90 minutes, reading and writing, and at least three times I was checked on. Would I like some more water? Another coffee? An espresso? Beer? Wine? I was, honestly put, shocked at the service. In the evening, after my walk to see the sunset – a mere hundred yards uphill provided solitude and a superb view of Apollo’s Gate and about 200 degrees of ocean views – I sat again and was offered whatever drink I’d like. Not being a drinker, I opted for a Coke, but George brought wine he made at his home for two Canadian visitors. It was white wine that he poured from a 1.5L water bottle, chilled in the fridge in the lobby, and he was justifiably proud when they reported their amazement and satisfaction. The pair were as surprised as I at the level of attention, care, and friendliness of the staff here. The owner sat with me for twenty minutes – talking politics, Greek culture, and what it means to run his business on Naxos. He explained that the god Zeus was not only the leader of the gods but also was the god of hospitality, and that the Greek people are inspired to be proud and gracious hosts. That was the word I hadn’t quite put my finger on all day, because compared to this, I’ve never experienced it before outside of staying with family or friends. Hospitality. The quality of hospitality here astounds me. I am touched. It surely makes me want to return to Naxos in general, and to Studio Margo in particular. Oh, and the room cost me under $50 USD per night. That seems relevant. Frankly, I’ve had much worse experiences with kindness, generosity, service, and hospitality at four or six times that rate. Nothing, in fact, compares to this place. The truth is that most places don’t even consider the sort of attitudes prevailing here to be in their purview – they’re justified by the low bar set by everyone else in the so-called hospitality business in treating the customers as cash-carrying cattle, even (especially) at the highest-end hotels. At no point could I see these folks saying (or even thinking) “This is a $50/night place; we don’t need to do that…” I rather get the impression that if a thing can be offered, it will be offered. You will not have a seaside balcony here, but I’m not sure it’s worth the difference – not to me, anyway – in price that would take me out of this lodging and into anything else, even for the view. I also think it relevant to mention that I’m receiving nothing but hospitality-sans-expectation for writing this fluff piece. I am moved to write because I continue to be amazed. The owner suggested that next time I come to Naxos, I should stay for a month. I just might do that. 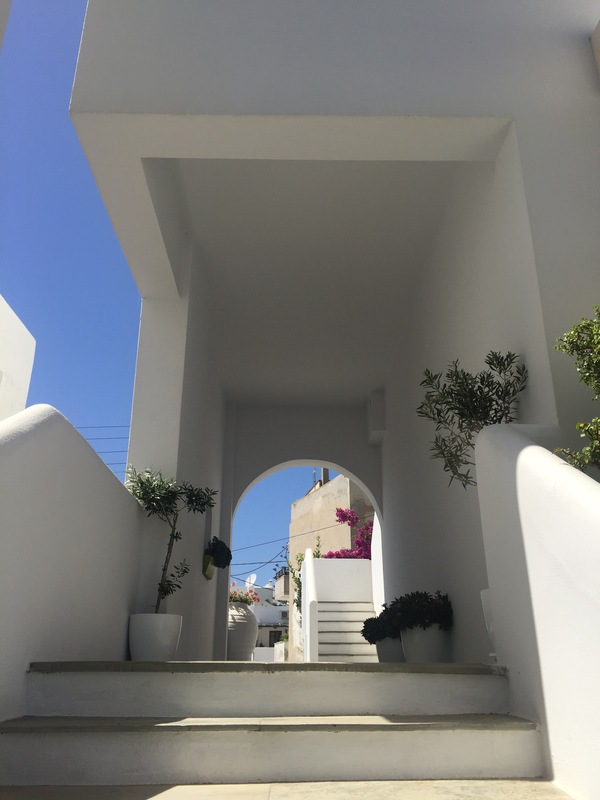 Despite me going on about the atmosphere at Margo Naxos, I have other comments up my sleeve – about the island at large and about touring Greek isles. It’s just that… I felt compelled to write about my lodging first – something that’s never happened before (as a point of reference, I’ve stayed in dozens of hotels and motels in the U.S. in at least 20 states and including the ritziest four- or even five-stars in Baltimore, Boston and New York; for Europe, I’ve got under my belt at least 30 hostels, 15+ bed and breakfast or pension houses, and a few hotels… this place puts all of them to shame). Follow all of my summer adventures from the main 2017 travel page. There’s more to come! This entry was posted in Travelogue, Travelogue 2017, Travels and tagged backpacking, bed and breakfast review, bed and breakfasts, cyclades, greece, hospitality, hostel review, hostels, hotel review, hotels, island-hopping, islands, kyklades, Naxos, pension houses, review, service, Slow Travel, travel. Bookmark the permalink.